Stereotactic radiosurgery (SRS) is a way to treat brain disorders. It uses highly focused beams of radiation to target specific areas of the brain. It can also be used on other parts of the body such as the spine. The beams of radiation destroy the tissue that a neurosurgeon would have removed during an operation. Review your regular medications with your doctor. You may be asked to stop taking some medications before the procedure. If advised by your doctor, use a special shampoo. Do not use any hair creams or hair spray. Bring your regular prescription medications with you to the hospital. Do not wear jewelry, make-up, nail polish, a wig, or a hairpiece. Remove any contact lenses, eyeglasses, or dentures. An IV line will deliver contrast material, medications, and fluids. You will receive a mild sedative to help you relax. A local anesthetic may be injected to numb your scalp. The procedure will be done using beams of highly focused gamma rays. It is used to treat smaller brain tumors and functional brain disorders. Head frame placement—Local anesthesia will be injected into the front and back of your head to numb your scalp. A box-shaped, aluminum frame will be attached to your skull with special pins. This will keep your head from moving during treatment. Imaging—You will have a CT scan and/or MRI to locate the tumor. If you are being treated for an AVM, you may have a test called an angiography to locate the abnormal veins. Computerized dose planning—You will relax for about an hour while your doctors plan your treatment. When they are finished, you will lie down on a special couch. Your doctor will talk to you about the number of treatments you will receive and how long they will take. Your head frame will then be attached to a helmet full of small holes. Each hole will allow a single ray of radiation to target a specific part of your brain. Radiation delivery—The doctors and nurses will leave the room. Your couch will move into the treatment area. You might hear a click as the helmet locks into place. Your doctor will be able to see and hear you during the entire procedure. You will be able to talk to your doctor. You will remain still during the procedure and so will the machinery around you. You will not be able to see, feel, or hear the treatment. When treatment is complete, the couch will move back to its original position. This treatment uses one large, powerful radiation beam. 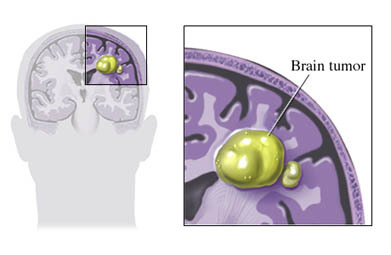 It is used to treat small and large brain tumors. You will go through the same phases listed above. During radiation delivery, part of the machine will move around you. The treatment couch will also be moved. Some newer systems can also deliver radiation to tumors of the spinal cord. This treatment is given using a small linear accelerator that is on top of a robotic arm. It is used to treat tumors and injuries of the brain and spine. No head frame is used. Set-up—If you are being treated for a brain tumor, a special mask will be made to fit your head. No pins are needed to keep it in place. You will be given a CT scan, and possibly an MRI, with the mask in place. If you are being treated for a spinal tumor, a customized foam body cradle will be made instead of a mask. You will most likely have some small metal markers called fiducials implanted near the tumor. The markers will help guide the radiation beams during treatment. The fiducials are implanted during a short outpatient procedure. After they are in place, you will be given a CT scan. Treatment planning—You may be allowed to go home while the doctors finalize your treatment plan. Actual treatment may take place that same day or several days after the set-up phase. Treatment delivery—You will be fitted with your mask or body cradle and then lie down on the treatment table. X-rays will be taken before the treatment starts. After treatment begins, the robotic arm will move around you and administer radiation beams from many different angles. Sometimes the arm will stop and more x-rays will be taken. The head frame and IV line will be removed. Your head will be wrapped in gauze or small bandages will be placed at the pin sites. Radiation delivery can take up to 2 hours for cobalt-60-based treatment and LINAC-based treatments. Robotic radiosurgery treatments can take up to 3 hours. The total procedure usually takes 2-4 hours. Anesthesia prevents pain at the pin sites if a head frame is used during treatment. You will feel some pressure as the head frame is attached. The treatment itself causes no pain. You may experience headaches or nausea a few hours after treatment. You will be given medication to relieve any discomfort. SRS works over time. It may take several months to several years to see results. About one month after your procedure, your doctor will check your pin sites and do a neurological exam. CT scans or MRIs will likely be done sometime after the procedure to determine if treatment was effective. The number of scans and how often you get them may vary. If you were treated for an AVM, you will have a test called a cerebral angiogram 2 to 3 years after treatment. The test will determine if treatment was successful. In many cases, SRS treatments can be repeated, if necessary. Frequently asked questions. International Radiosurgical Association website. Available at: http://www.irsa.org/qa.html. Accessed March 29, 2018. Linear accelerator. Radiology Info—Radiological Society of North America website. Available at: https://www.radiologyinfo.org/en/info.cfm?pg=linac. Updated May 1, 2017. Accessed March 29, 2018. Stereotactic radiosurgery (SRS) and stereotactic body radiotherapy (SBRT). Radiology Info—Radiological Society of North America website. Available at: https://www.radiologyinfo.org/en/info.cfm?pg=stereotactic. Updated February 17, 2017. Accessed March 29, 2018.